Sir David Attenborough presents the wandering albatross of the South Atlantic Ocean. Sir David Attenborough presents the wandering albatross of the South Atlantic Ocean. 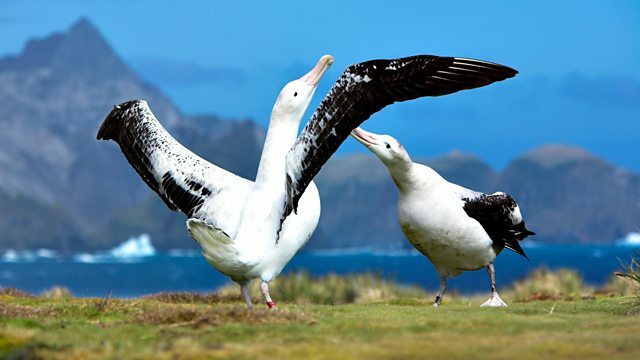 On the windswept South Georgian Islands, a stiff breeze is ruffling the grass tussocks as a Wandering Albatross is billing and coo-ing to its mate. These huge seabirds, mate for life and can live for 50 years (or more). Longevity is vital for a species which produces only one chick every two years. The chocolate brown youngster takes to the air nine months after hatching, the longest pre-fledging period of any bird, but when it does, it breaks another record, as adults have the longest wingspan of any living bird, which can reach over 5metres. Webpage image courtesy of Yukihiro Fukuda / naturepl.com.